1. You shall use the site for lawful purposes only. You shall not post or transmit through the site any material which violates or infringes in any way upon the rights of others, which is unlawful, threatening, abusive, defamatory, invasive of privacy or publicity rights, vulgar, obscene, profane or otherwise objectionable, which encourages conduct that would constitute a criminal offense, gives rise to civil liability or otherwise violate any law. Without B2C Jewels LLC express prior approval, you shall not post or transmit through the site any material which contains advertising or any solicitation with respect to products or services. You shall not use the site to advertise or perform any commercial solicitation, including, without limitation, the solicitation of users to become subscribers of other online information services competitive with the site. Any conduct by you that in B2C Jewels LLC discretion restricts or inhibits any other user from using or enjoying the site will not be permitted. 2. The site contains copyrighted material, trademarks and other proprietary information, including, without limitation, text, software, photos, video, graphics, music and sound, and the contents of the site are copyrighted under the United States copyright laws. You may not modify, publish, transmit, display, participate in the transfer or sale, create derivative works, or in any way exploit, any of the content, in whole or in part. You may download one copy of any copyrighted material for your personal, noncommercial home use only. Except as otherwise expressly permitted under copyright law, no copying, redistribution, retransmission, publication or commercial exploitation of downloaded material will be permitted without the express written permission of B2C Jewels LLC and the copyright owner. In the event of any permitted copying, redistribution or publication of copyrighted material, no changes in or deletion of author attribution, trademark legend or copyright notice shall be made. You acknowledge that you do not acquire any ownership rights by downloading copyrighted material. 3. You shall not upload, post or otherwise make available on the site any material protected by copyright, trademark or other proprietary right without the express permission of the owner of the copyright, trademark or other proprietary right and the burden of determining that any material is not protected by copyright rests with you. You shall be solely liable for any damage resulting from any infringement of copyrights, proprietary rights, or any other harm resulting from such a submission. By submitting material to any public area of the site, you automatically grant, or warrant that the owner of such material has expressly granted B2C Jewels LLC the royalty-free, worldwide, perpetual, irrevocable, nonexclusive right and license to use, reproduce, modify, adapt, publish, display, translate and distribute such material (in whole or in part) and/or to incorporate it in other works in any form, media or technology now known or hereafter developed. You also permit any other user of the site to access, view, store or reproduce the material for that user's personal use. You grant B2C Jewels LLC the right to edit, copy, display, publish and distribute any material made available on the site by you. 4. The foregoing provisions of are for the benefit of B2C Jewels LLC, its subsidiaries, affiliates and its third-party content providers and licensors, and each shall have the right to assert and enforce such provisions directly or on its own behalf. You acknowledge that although B2C Jewels LLC has attempted to accurately depict the colors of the B2C Jewels LLC products offered on the Site, the color displayed is dependent on many different factors including the display of your computer monitor. As such, you further acknowledge that B2C Jewels LLC is not responsible for any inaccuracies or color variations in the products you purchase from the Site. Moreover, the products may be depicted larger or smaller than their actual size depending on your monitor and/or computer settings. Pictures may also be enlarged to show details. 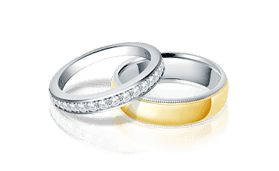 In the event of an error in pricing on the Site, B2C Jewels LLC reserves the right to correct such error, and in B2C Jewels LLC sole discretion, to refuse or cancel any order placed for a product at an incorrect price or in the event of the item being out of stock. All prices listed on this site are in U.S. dollars. B2C Jewels LLC also assumes no responsibility, and shall not be liable for, any damages to, or viruses that may infect, your computer equipment or other property on account of your access to, use of, or browsing in the Site or your downloading of any materials, data, text, images, video, or audio from the Site. The Site may contain links to third party web sites or resources. B2C Jewels LLC makes no representation or warranties concerning such third party web sites or resources and is not responsible for the content or operation of such third party web sites or resources, and shall have no liability in connection with them. It is possible that other users or unauthorized "hackers" may post or transmit offensive or obscene materials to or from the Site and that you may be involuntarily exposed to such materials. It may also be possible for other users or "hackers" to obtain personal information about you. By using the Site, you assume the risk of such occurrences. You agree that all terminations shall be made in B2C Jewels LLC’s sole discretion and that B2C Jewels LLC shall not be liable to you or any third-party for any termination of your account or access to the Site. The B2C Jewels LLC logo is a trademark of B2C Jewels LLC. All rights reserved. All other trademarks appearing on the site are the property of their respective owners. Currently, sales tax is charged on orders shipped to addresses in the following states: New Jersey, New York, Washington and Pennsylvania. 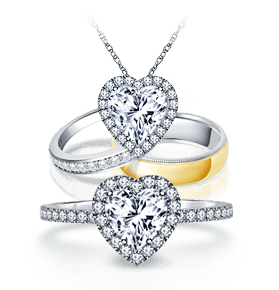 Comparison purchasing is defined as purchasing numerous jewelry items and/or diamonds together with the intention of keeping only one of the items, and returning the rest of them. To maintain low pricing and value, comparison purchasing is not allowed on b2cjewels.com as it causes costly overheads due to re-stocking and manual efforts. 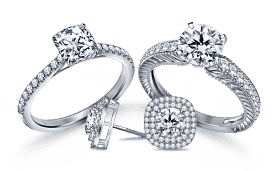 Please contact one of our gemologists or jewelry consultants at 1-866-522-2539, or email us at info@b2cjewels.com and we would gladly help in answering any questions and provide guidance on which item would be suitable for your requirements.